If you are an Indian bride who is about to get married, it is impossible that you haven’t considered wearing a Sabyasachi lehenga on your big day. But I am sure, you must’ve always wondered how much does a Sabyasachi lehenga really cost? To make your search easier, I have listed down Sabyasachi bridal lehenga price of some of his creations that real brides have worn on their D-day! Scroll down and have a look at how much does a Sabyasachi bridal lehenga cost, and is it affordable enough for you to wear on your wedding. Also, if you are looking for your Sabyasachi bridal lehenga in Mumbai, I have listed some lehenga shops in Mumbai where you can find your dream Sabyasachi lehenga. A simple Sabyasachi lehenga that you can wear for your other wedding functions like mehndi or sangeet would cost you anything between 1 to 3 lakhs. 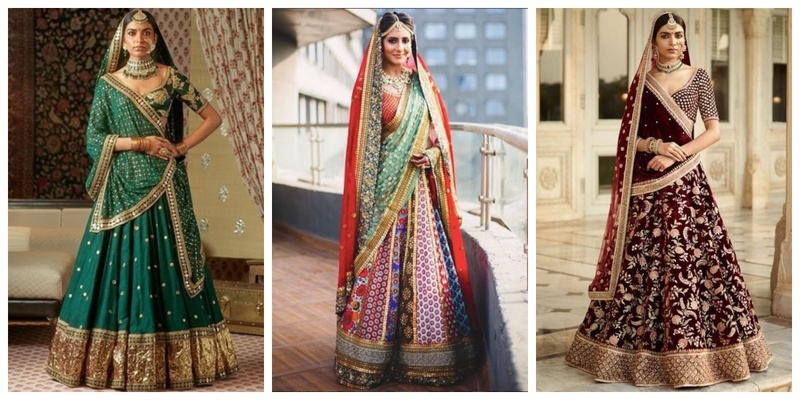 These are the lighter lehengas, which are made specifically for pre-wedding functions. This ivory lehenga crafted in silk with sequin embroidery and contrast border is designed to be worn for a sangeet night, or perhaps a even a cocktail party. This Sabyasachi lehenga price is INR 2,95,000. This pink flared lehenga with floral print detailing and embellished border is another Sabyasachi lehenga, which is fit for an afternoon mehndi ceremony. This Sabyasachi lehenga price is INR 2,95,000. This blue flared lehenga designed in silk with embellished detailing is ideal outfit for your cocktail evening. This Sabyasachi lehenga price is INR 1,82,500. The flagship store of Sabyasachi is surely one of the best bridal lehenga stores for your wedding shopping in Mumbai. At this store, you will find the entire Sabyasachi bridal range, which won’t be available at other places. Address: 15-A, Shishir, Near Maneckji Cooper School, Juhu Tara Rd, Mumbai. Store Timings: Monday - Sunday 10 a.m. to 8 p.m.
Store Timings: Store Timings: Monday - Saturday 11 a.m. to 7 p.m. So here’s hoping that if you’re looking for your Sabyasachi wedding lehenga in Mumbai, then these lehenga shops in Mumbai should definitely help you find your dream wedding lehenga!